TheiLife Birthday Celebration Draws to a Close! Winners of free software within! 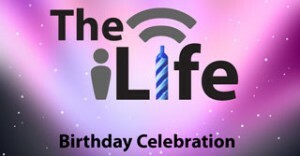 With theiLife now officially one year old, it is time to conclude the celebration and move onto year two. It’s almost hard for me to believe. What started as an idea, forming into an idea supported by a few friends, to a domain name and from there- I can’t even begin to explain how it took off. Last years highlights include attending the 2008 Macworld, WWDC, iPhone 3G launch and various Apple store openings which all really defined the sites culture. We are also expanding in ways beyond just Apple, and are actively trying to bring as many people who appreciate technology to blog. Due to the fact I am now in college along with a number of iLife writers, it makes it hard to keep the site up to speed, especially compared to the professional bloggers. But that is why this site isn’t for news. We are still committed to the site and you should start seeing some new changes coming soon. With that said, it is time to announce winners of software! To all the users who commented and expressed their views on the site, we all greatly appreciate your continued interest in the site! Users who have commented on the two birthday articles were entered into a drawing and will be receiving emails with the software license they won. Thanks for your participation!